Well Christmas is almost here, the trees are up and the kids are excited. So maybe at this time of the year it is understandable that my thoughts have turned in the direction they have...but first let me explain a little. I am not religious. I have friends who are deeply religious and others who are completely atheist. I am happy to let each be to their own. However, this current book is a very Dan Brown affair. I had known from the first that it was about religion, but hadn't counted on how intricate and twisting it would be, to call into question the very nature of our existence. If you have attended one of my author talks, you will know that I seldom know how a plot will unfurl, so it came as rather a surprise. But I am enjoying each revelation! Here is a little snippet where the local Preacher comes to a realisation. He slipped from his seat on the pew to a kneeling position on the floor. Facing his alter he made the sign of the cross and folded his hands in prayer. I can't believe the speed at which I am working on my newest book - believe it or not I am writing two chapters a day! It is such a darkly twisting plot that the words are flowing out of me almost faster than I can commit them to the screen. Not much of it is printable here though, as I am aware that children and adults alike read my blog and this particular book is suitable for the over fifteens only. I will post a list soon for venues where I will be conducting book signings and author talks. I try to write Monday to Friday. I don't always manage it but I try nonetheless. As Meatloaf says in his song, "some days it don't come easy, and some days it don't come hard..." Today I am fully in my flow. She walked briskly, not really seeing the scenery or noticing the people who passed her on the path, their polite hellos not denting her thoughts. For so long her life had been average – perhaps less than that even. It had been mundane. She had slept and risen, cooked and cleaned, worked and relaxed to the singular beat of a lethargic drum. Now it seemed as if some fiend had snared the instrument and beat instead on it with manic glee, thrashing a new rhythm out with wild abandon, building to a crescendo, a symphony of notes cascading from on high and being propelled back upwards by the sheer force of the tempo. And she was being hauled alongside it. If you would like to know more about how and why I write, then why not come along to one of my author talks? I will be posting details of the next venue shortly. As always you can contact me on carmen.capuano@ymail.com if you would like to arrange a talk for a school or group you are involved with. Today I am working on The Plan. It's turning out to be quite a tale and as usual there are elements contained within it that I never envisaged from the start. It originated from a short story I wrote some years ago and may yet have a change in title before I am done but essentially its about a woman and her struggle to re-establish a life for herself after the demise of her marriage. Yes and of course technically he still was, although she omitted to give them that piece of information. How did she feel? Betrayed? Relieved? Sad? Like one door had closed but another had opened? To avoid the question for a moment she fetched a large bag of popcorn and tipped it into a bowl. Watching the bowl fill up she knew suddenly how she could explain herself. She watched Ellie select two bits and push them together. “Well people are like that too. Sometimes they can stick together and sometimes they can’t. Your dad and I just were the type that couldn’t…” something caught her eye and she dipped her hand into the bowl, plucking it out and curling her fist around it. “And then sometimes - if you are really lucky - you find this,” she uncurled her fingers to reveal two kernels of corn which had somehow in the popping process fused together. I hope to be posting some exciting news soon. This Sunday you will find me at the Bromsgrove Holiday Inn where I shall be talking to readers and selling signed copies of my books. If you have already purchased one of my books from somewhere else you can still come along and have it personalised. And we can have a good old natter! I will inform you of other events and author talks nearer the dates. What I will tell you though is that a wonderful idea came to me for a sequel to Split Decision. However since I am still finishing The Plan and have yet to edit The Boy Who rescues Pigeons, I can't see me getting to it until next year. As you know I don't often paste things that have external links but today I found myself thinking once more about this extraordinary image. For that reason I decided to post it here and now. Happy Reading folks and have a spectacular All Hallows Eve and Bonfire Night. Oh I have a secret...or maybe even two...and I can't tell...and it's killing me! Now those of you who know me personally will know how bursting with news I can get and this is such a biggie for me! But at the moment I am sworn to secrecy, so you will just have to wait. What I can tell you about is the four whole days of decorating I have just done - six hours a day for four days on one staircase. Yes you read that right - ONE staircase! That said, it is an incredibly long staircase with fiddly spindles all the way along and it didn't help that on the very first day I stuck my paintbrush into my giant coffee mug instead of the paint pot! Thanks also to everyone who sent me birthday wishes via Facebook. They were much appreciated. On Saturday I had a lovely night with fellow author and Bromsgrovian, the glamorous and very gorgeous Cat Weatherill. We consumed a bottle of wine and put all of mankind to rights [we didn't include womenkind as we think they are generally ok ;)] It's always a pleasure to catch up with this vibrant woman. If you haven't yet read my interview with her, why not take a look now. Last night I went Blues dancing. Yes you read that right...blues. As you know my latest book centres around my dance experiences [and a few others - ahem!] and I thought I ought to widen my experience. Prior to arriving, I had thought that it would be simply a slower version of Ceroc and in a way it was. But it was also far more than this, with elements of Argentinian Tango and other Latin influences mixed in. A very Happy Reading to you all. People ask me all the time how I get my inspiration for stories. The truth is always much less exciting than what they probably think. Stories come to me like jokes come to comedians, I would imagine. They pop up in my head, sometimes fully fleshed out and sometimes requiring a little work to join the dots together. But the ones I choose to work on are the ones which have characters who are more than three-dimensional. In my head, these are living, breathing entities in their own right and in some ways I have no more control over them than an absent mother does of her children! Therefore I didn't set out to write The Boy Who Rescues Pigeons for any other reason than it was a fantastic story idea and I thought the characters had something powerful to say. But at the beginning I wasn't sure what that would be. Now I do! This book has been a painful journey for me and one which has been more personal than perhaps many of my other books. You see I was the little girl who fed the birds and I guess at heart I still am her, in all her frailties and foibles. Life and time moves us all in different directions and sometimes that is far away from where we really ought to be. Slowly I am finding my way back to my rightful place - and will there be pigeons there? You can bet on it. So introspection over, here is today's snippet, hot off my laptop. Oh and to quote Mary Poppins, "Feed the birds, tuppence a bag..."
Brighteyes’s empty box nearly broke his heart and for a moment his mind played tricks on him, making him see what wasn’t there - the little bobbing head, the iridescent sheen of feathers, the bright inquisitive eyes. He flung open the window. It was just starting to get dark outside although the hour was not late. No birds flew high in the sky or overhead but he sprinkled the contents of the bag across the outside of the ledge anyway. They would be there ready for the morning and that was for the best anyway. He ran a hand across the crumbs, evening them out and breaking the bigger chunks into more manageable bite sized pieces. Maybe the pie would attract all different types and sizes of birds, maybe only the braver ones would alight there. Time would tell. But he knew that as long as they were willing to come, he would be willing to feed them. For more snippets of this or other books, take a look at my previous blog posts. This morning I met with my 'coffee ladies'. We discussed whether it was indeed possible to put your mind to doing something and achieving it even if it was beyond your intelligence level. For me the jury is still out on the subject, however my character Lucas is finding that school work has a new relevance for him now that he has a rescue pigeon in his care. He had spent the Saturday morning doing his homework with Brighteyes watching him from the window sill. For maths he had work in fractions and decimal points to be done and he flew through the questions with ease, regardless of whether they were purely numerical or worded ones, reshaping them in his mind to have reference to the bird. Two and a half multiplied by 3.8 became two full adults and a baby bird requiring 3.8 mls of medicine each. Five and seven eighths divided by 2.9 became five adults and a teenage bird who had to share almost 3mls of water between them…suddenly everything had a relevance, a purpose that he understood. Even his English homework had a significance now that it hadn’t had previously. In his freestyle assignment he chose to write an investigative report on how pigeons were maligned by society, vilified because of the erroneous belief that their faeces was harmful to humans. And to his surprise he loved every moment of the work. Lucas felt a stab of guilt. Was he neglecting Brighteyes? He really didn’t intend to leave the bird alone for so long but then again was it in its best interests to make it too tame either? What would happen once it was released to the wild if it was too used to human company? He was honoured by the bird’s acceptance but he was also more than a little worried. Would she pine for him when she was back in the wild? Would she feel betrayed? Abandoned? Alone? And him – how would he feel having to give her up to fate, not ever knowing if she was alright? They say that if you love something you should let it go...I think that will be a hard lesson for Lucas. Keep your fingers crossed for me and for him. Until my next post - Happy Reading! She laughed again. “Don’t take everything so personally,” she said. “I’m sorry but you have spent the entire conversation insulting me and I’m not supposed to take it personally?” she really did take the biscuit, he thought. Lucas thought hard. The conversation was going off track and he was losing the thread rapidly. “When you watch something and you see it!” she was getting annoyed with herself that she couldn’t remember the word. “That’s it! That’s the thing I meant – an obstication! That’s what it was!” she was almost skipping with excitement now. Molly is turning out to be a more central character than I had anticipated but from the moment she bounced into the story I knew she had some important things to say...I wonder what she will do next? When I get a spare moment I will give you a more extensive list of my forthcoming events. 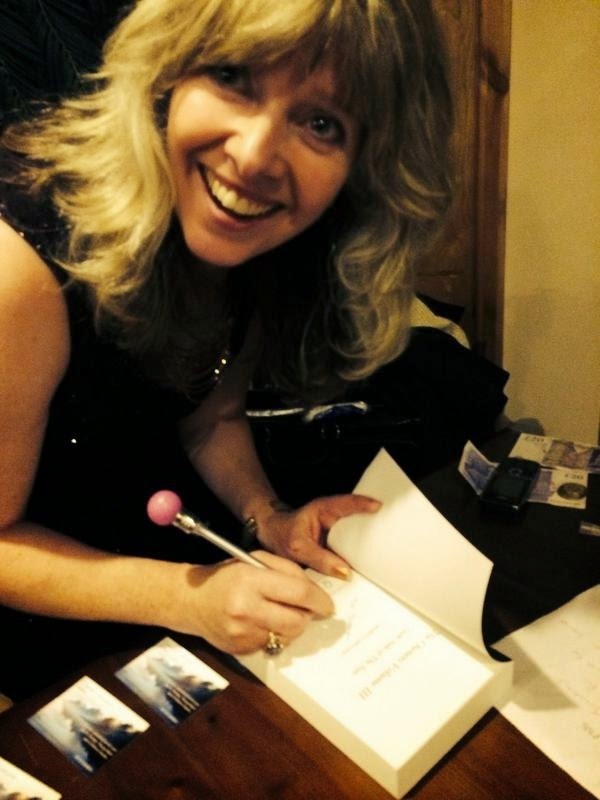 Bookings are still being taken for the few remaining slots this year, however I am also now confirming dates for 2015 author talks and signing events. If you would like to schedule one with me you can contact me at carmencapuano@ymail.com to request details and to book. We are kicking off a new chapter and a new season with sci-fi/fantasy author Carmen Cupuano. Self-published, self accomplished Capuano has created a new world for the sci-fi/fantasy genre in a set of books set in an post-apocalyptic world... but let's not give too much away. We invite you to join us and hear more about Carmen, her illustrious books, why she writes in her genre and the chance to grab yourself a few signed copies. Aimed at teenagers and young adults, as well as a mature audience, this science fiction fantasy imagines that humans are kept as pets, originally unknown to them, and then flickers of consciousness about their situation emerge . . . Borrowing elements from Andrew Nichol's The Truman Show and Thomas More's Utopia, Capuano develops a good idea well with scope for several more instalments. The time, location, and place are uncertain, but the thematic ambition is bold, an exploration of what humanity is, and as the plot unfolds, what it is not, in a 21st century morality tale. Pet humans are kept by the Eyons, in a playful twist on the late 20th century Tamagotchi toy craze in which young children rushed to buy the Japanese hand held computer virtual pet, and nurture it. The second volume, Storm Clouds is self-contained and opens with cataclysmic storms threatening to engulf the West Coast of America, leaving twelve year old Dan Ryan no choice but to be evacuated to New York and into the care of his Uncle Jack. Both volumes are pacy, easy reads, with a fast developing plot that addresses moral questions without being overtly moralising. Storm Clouds has the more conventional narrative, Alone is the more thought provoking with an alien language which borrows from Orwell's 1984. The familiar terrestrial setting of America is a more secure setting for the author although having Jack Ryan as a significant protagonist, a name popularised by Tom Clancy in his spy series,+ may be a little distracting Stateside. As a writing debut it is a strong start, and volume three should be following soon. Capuano feels that there is the potential to add several more to the series , and I think she is right. Young readers will be attracted to the page turning storytelling, whilst older readers will enjoy the time honoured philosophical and moral dimension which the author revels in tackling. Here is the latest snippet from The Boy Who Rescues Pigeons. Lucas is growing closer to his rescue every day. But the bird is growing stronger and soon he will have to face that bittersweet moment all rescuers do - he will have to let the bird go back to the wild. This book is now about 2/3 complete. I will let you know how I get on. In the meantime if you want to look at my other work just scroll down or click on one of the links. And as ever - Happy Reading! Click onto the section on the right hand side of this page to read about my latest interview with storyteller and author, Cat Weatherill. Cat has travelled around the world, honing and displaying her craft and it was a real pleasure to interview her. Next week I will be working hard to bring you the latest snippets of my chapters and keeping you generally up to date with my progress.